1940's Waitress Uniform - or Disney Character?! 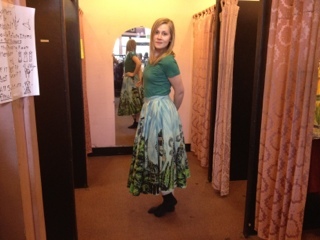 I found this dress 3 years ago in the 8th Avenue Antique Mall in Nashville. I tried it on and fell in love, but they were asking $80 for it and just could bring myself to spend that kind of money on it. I returned one week later with intentions of bitting the bullet and buying it despite the price tag, but it was gone! I've searched for it there many times since that day to no avail. Then, a few months ago, I was driving past one of my favorite East Nashville vintage shops - Fanny's House of Music - on a Saturday. They had rack upon rack of vintage clothing set-up on the lawn outside the shop. I parked my car and started searching through the beautiful pieces. I was shocked when I slid aside a polyester 70's jumper and revealed this beautiful dress! It found me! This dress truly has an ingenious design. It's a wrap dress and it has interchangeable front pieces. So, if you spill coffee on the front of your uniform, you can just go into the back, undo the buttons, switch up the wrap, and voila! You have a clean uniform on again! I am at the 77th Annual Old Time Fiddlers Convention in Galax, Virginia camping with my dad and PJ and many of my best friends. While visiting with dear friends Johnny & Mary, Mary told me she had brought one of her mother's dresses from the 50's with her to show me. So tried it on and my oh my, what a beautiful garment! She told me I need to take it home with me. Thank you so much Mary! For about a year now, I have been gawking at hand painted Mexican circle skirts on EBay but I've never bid on one as they're always up in the hundreds of dollars. 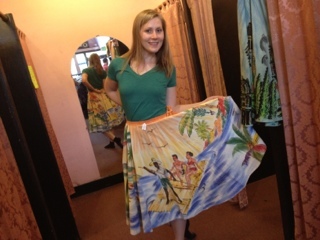 Today I found three beautiful skirts at Mars in Berkeley, CA-- all under 50 bucks. I would most certainly taken one home with me if they had been darker/brighter colors (which work best on stage.). I will continue my search. This beautiful hand-made 1940's house dress belonged to a woman named Nora, the great-grandmother of a good friend of mine, Ms. Macon Gurley. Nora lived in north-eastern Virginia and she was a darn good seamstress with impeccable taste in fabric. This is a wrap dress featuring a side tie, collar, and pocket. Primary colored flowers pop out on a teal and white stripe backdrop. Thanks Nora! And thanks for reading friends. Sequins! Sequins! Sequins! I can't believe it took me this long to put them on stage. They shine in the lights; they make a girl feel like a star! This top was a Christmas gift and man oh man have I been getting good use out of it. 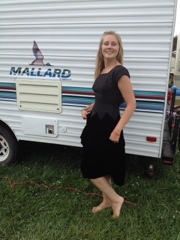 I pair it with this black cotton 1950's pleated skirt that I hemmed myself (more on that in a later post). Add black high-healed mary janes and we're in showbiz baby. This dress is one of my most unique. It is handmade (no tags) and the material appears to be fabric from a sugar sack...well a sack of some kind-- I just guessed sugar as the print is all scenes from and names of islands in the Caribbean. It has elbow length sleeves a knee length hem. I definitely would guess this was made and worn somewhere in the south during the great depression. It is a small piece of history. I'd love to know it's full story. 19...70's? shhhhh. don't tell on me. Now I know what you're thinking...I've lost it. But hey, hear me out! This skirt may be from the 70's but I am wearing it to fit my 1950's aesthetic. I also love the print. Paired with my pin-up wedges and a lacy top, it evokes fifties right? 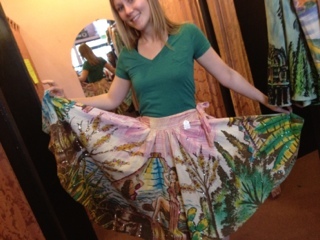 I bought it at one of my favorite vintage stores: Talk of the Town just outside of Cincinnati. 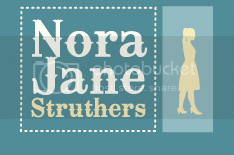 My name is Nora Jane Struthers. I am 26 years old and I’ve been in Nashville for two years, via New York City. My Vintage Voyage began right after I graduated from NYU and I started playing out, around New York, in a bluegrass duo with my dad. On stage I always dawned a dress from the 40’s or 50’s and my dad spiffed up in a suit and tie—the tie color chosen to match my outfit. Somehow it just feels right to sing songs that have so much history in a dress that is itself a piece of history. Now that I am living in Nashville, I have my own band: Nora Jane Struthers & The Bootleggers. Traveling around the country playing music, and stopping at antique malls, thrift and vintage stores, has helped me take my dress collection to a new level…I used to have a pretty dress for every day of the week; now I have a pretty dress for every day of the next three and a half months. I love vintage for the same reasons the other Vintage Voyagers do: they’re designed and cut beautifully for women’s bodies, the fabrics are durable and the prints are quirky and unique, they often have pockets, charming buttons, embroidery, and perhaps above all this, each dress has a story.